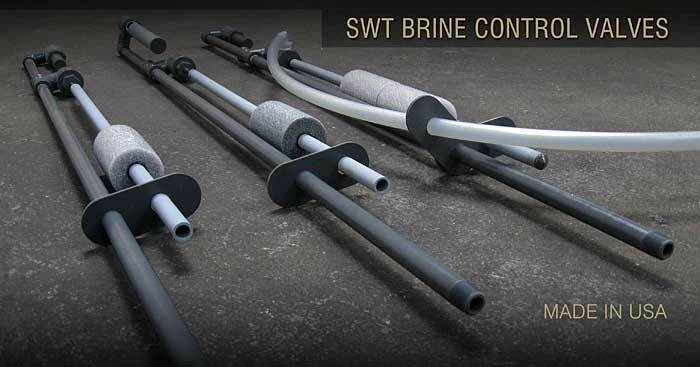 SWT Brine Valves are the oldest and considered the best in the water treatment industry. They operate hydraulically to ensure reliable operation—even in a power outage situation. All units feature durable PVC construction and adjustable brine refill. Models available with factory preset or adjustable brine draw level, and standard or overhead refill. Good for a variety of liquid level control applications. Suitable for use with saturated brine solution, potassium permanganate, HCl. Made from rugged, heavy duty Sch.80 PVC pipe. The brine valve is available in 3/8, 1/2, 3/4, 1, 1-1/4 inch pipe sizes. Other heights available per request. Long float adjustment range. Very precise measurement of brine. The valve provides accurate volumetric control of brine draw. The same amount is drawn every time. The voids of the salt do not affect the brine draw. Prevents air draw into the mineral tank. For use in large or odd-shaped brine tanks where refill water needs to be dispersed over a large area. This avoids salt bridging problems and increases water contact with salt for faster saturated brine creation.